An internal document, entitled Detailed Rules for Public Security Bureau’s Implementation of “Operation Knocking on Doors,” issued by a public security department in Hebei Province. “Operation Knocking on Doors” sends officers to photograph believers under false pretexts, part of a broader surveillance system to track religious everywhere. Ms. Li is a member of The Church of Almighty God (CAG) who lives in a village under the jurisdiction of Zhangzhou city in Fujian Province on China’s southeastern coast. One day in July 2018, the head of her village came to the door of Li Juan, while her family was busy making funeral arrangements, and questioned her about whether she had attended any church gatherings recently. The most strange thing about the village leader’s behavior while questioning Ms. Li is that he continuously pointed his cell phone at her. Li Juan wasn’t surprised, because this wasn’t the first time she was investigated and photographed. 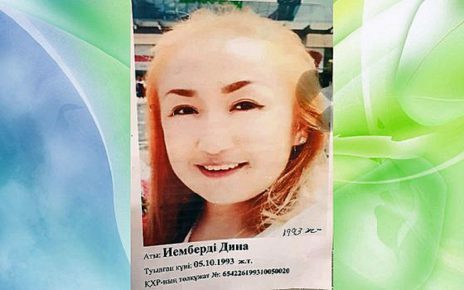 Ever since June 2016, when she was arrested and detained for her belief, she has been subjected to multiple investigations. Because she was clearly a target, she stopped attending religious gatherings out of the fear of implicating her coreligionists. 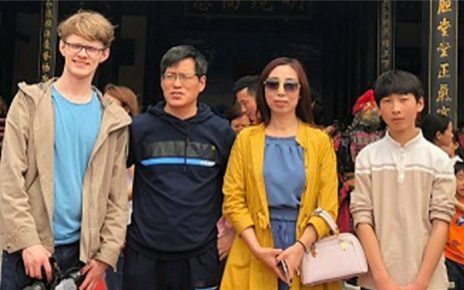 The extraordinary measure of photographing people in their own homes is part of a major campaign called “Operation Knocking on Doors” that monitors believers who are followers of organizations that had been put on the list of xie jiao. Bitter Winter has received a large amount of information about members of such religious groups across China who had been photographed and investigated by government personnel. Some officials arrive at people’s doors carrying propaganda flyers promoting “cleaning up crime and eliminating evil” – another nation-wide campaign that, on paper, is supposed to fight organized crime but, in reality, targets religious people. Sometimes, officials forcibly enter the household and photograph the believers and their residence under the pretext of “protecting the safety of the masses.” To enter the homes, some claim that they are expunging the person’s criminal record or conducting a sanitation inspection while taking photos. Operation Knocking on Doors was launched in early 2017 on a nationwide basis, carrying out comprehensive, dragnet-style investigations of members of religious groups. The goal of the operation is to collect information on the “personnel” and activities of religious groups listed as xie jiao and to carry out networked surveillance of each believer. Bitter Winter obtained an internal document, entitled Detailed Rules for the Public Security Bureau’s Implementation of “Operation Knocking on Doors,” issued by a public security department in Hebei Province in northeast China. The document reveals the specific methods utilized to implement the operation. During each investigation, a total of five photos must be taken for each person under investigation: a front-facing photo of the person, the residence gate outside the home, the front door of the home, the interior layout of the residence, and some characteristic objects in the house. The entire process of photographing the residence must be recorded by video. All of the photographic and video data must be stored in dedicated computers belonging to the Domestic Security Protection Bureau. The document demands strict confidentiality regarding the operation, including that the name, purpose, and contents of Operation Knocking on Doors must not be disclosed. Investigators are also instructed to search for any items, computers, printers, optical-disc recorders, and similar devices that are used to promote religious beliefs in the household. If such devices are found, further investigation must be undertaken, and video footage must be recorded. According to insiders from public security departments, after these initial photos and other data have been stored, the believer is placed under comprehensive, non-stop surveillance through projects “Sharp Eyes” and “Skynet,” as well as other high-end electronic monitoring systems. The scope of the operation is so vast that even a believer who was arrested more than 20 years ago can be investigated. Mr. Huang, who lives in a county in Hubei Province’s Xiaogan city, is a member of Mentuhui (the Association of Disciples). 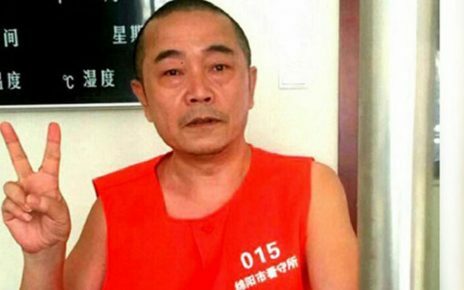 In March 2018, Mr. Huang was questioned and photographed by the police. This encounter occurred 22 years after he was arrested in 1996 for believing in God. Since he was worried that he could be arrested at any time, Mr. Huang decided to leave his home and work in another part of the country. Many believers find themselves in similar situations. Some choose not to attend gatherings due to frequent harassment by the authorities, and some flee into hiding for fear of being arrested. After the initial investigation, many local governments carry out follow-up surveillance operations on the basis of Operation Knocking on Doors. 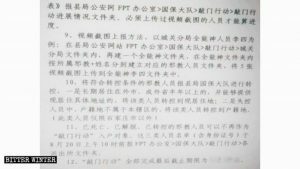 In April 2018, the local Chinese Communist Party (CCP) Committee Leading Group on Preventing and Dealing with Xie Jiao (the so-called 610 Office) of a county in Hebei Province issued a document entitled Notice on Doing a Good Job on Key Work for the Current Prevention and Handling of Xie Jiao. 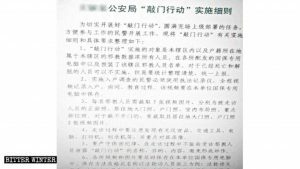 The document demands that “Operation Look-Back” be conducted to check and remedy anything that had been missed during Operation Knocking on Doors, conducting further surveillance of members of Falun Gong, the CAG, and other religious groups on the list of xie jiao. The document calls for “comprehensively strengthening control over the daily management” of “key persons” within the groups, making sure that they are constantly monitored. Besides, close attention must be paid to the movements of church members, and as much internal information as possible must be obtained. If a key person is “out of control,” those involved will be held fully accountable. Similar requirements are contained in documents from the provinces of Liaoning, Henan, and others. A document issued by the Political and Legal Affairs Committee of a county in Liaoning in November 2018, demands the promotion of Operation Knocking on Doors and Operation Look-Back, and calls for finding and investigating escaped and missing persons. “Supplementary door-knocking” work must be conducted for persons who have not been investigated at their home, and “supplementary recording” work must be carried out for information that has not been entered into the database, in order to ensure that nothing is overlooked and that key xie jiao persons are thoroughly investigated.